North West Europe: Winter has arrived and weather is expected to remain cold. South West Europe: France is cold while Spain and Portugal entering into cold season. South America: Still warm with same outlook next week. Middle East: Egypt is still warm with above season limit, rest of Middle East still hot. South Asia: Winter in Northern parts of India and Pakistan, with southern part getting mild. North East Asia: Japan, Korea and China in winter season, whereas Taiwan still in mild weather range. North America: Mexico warm to mild with same outlook, whereas in US colder than normal is expected for next week for Mid West, South East and North East. Crude oil prices remained stable through out the week as OPEC meeting was weighting on sentiments despite the resumption of Keystone Pipeline at reduced rates. Brent prices closed on $63.61/BBL on Friday, while WTI closed at $58.36/BBL. Future market closure on Friday for Brent at $63.64/BBL, $63.40/BBL & $63.13/BBL for Feb., Mar. & Apr. contracts, whereas WTI futures closed at $58.29/BBL, $58.31/BBL & $58.25/BBL for January, February & March 2018. Baker Hughes rig count reported an increase by 2 to 749 with US production number on the rise. Brent-WTI spread remained above $5.5 level before closing at $5.26/BBL on Firday. EIA Weekly report reported 3.4 million barrels draw down with stock at 4573.7 million barrels on 24th November 2017, against a market expectation of 2.3 million barrels draw down. Gasoline inventories at 214.1 million barrels reported on 24th November 2017, 3.6 million barrels build up against a market expectation of 1.2 million barrels buildup. Henry Hub prices had a bullish run due to colder weather outlook and closed at $3.06/MMBTU on Friday. Baker Hughes reported a decrease in gas rigs by 4 and total number stands at 180. EIA reported working gas in storage is 3,693 BCF as of Friday, 24th November 2017, net decrease of 33 BCF at the start of heating season, with market expectation of 37 BCF decrease. CME Henry Hub future on Friday closed at $3.059/MMBTU for January, $3.3.06/MMBTU for February and $3.019/MMBTU for March, depicting winter based high demand. North West European gas hub prices had a bullish run due to prevailing cold weather and cold weather outlook along with bullish crude and coal prices. NBP UK Day Ahead price closed at 56.3340 Pence/Thm ($7.59/MMBTU) on Friday, increased by 2.68% from last Friday. NBP UK Front month (January) price jumped to 58.448 Pence/Thm ($7.88/MMBTU) on Friday. TTF Day Ahead closed at €20.80/MWH (equivalent of $7.25/MMBTU) whereas front month price closed at €20.908/MWH ($7.29/MMBTU) on Friday. South West Europe prices followed a bullish run on cold weather in France along with bullish crude & coal prices and reducing hydro based electricity generation in Spain. Day Ahead PEG Nord closed at €21.35/MWH ($7.44/MMBTU) on Friday, whereas TRS France at €25.34/MWH ($8.83MMBTU), and Spain at €26.40/MWH ($9.20/MMBTU). PEG Nord front month closed at €21.44/MWH ($7.48/MMBTU), TRS at €26.10/MWH ($9.10/MMBTU) on Friday, putting pressure on LNG prices for SW Europe. European gas inventory stands at 80.38% as of 30th November 2017 in line with last year number of 80.50%. LNG prices remained stable with mounting pressure due to cold weather in North East Asia & Europe, bullish European gas prices specially from Spain due to lower hydro based electricity generation, strength in crude and coal prices, commissioning of second terminal in Pakistan and appetite from Turkey. Availability of reduced volume from Bontang export facility along with delay in nuclear plant start-up in Japan may fuel up the demand. Spain hydro based electricity reach lowest level of 3.23 TWH this week with focus on now on LNG procurement, in the month of November Spain received 1.29 million tons through 22 vessels. Pakistan second LNG import terminal commissioned and now Pakistan is in the market for February cargoes. Winter based demand is also picking up in Turkey, with approximately million tones arrived at Turkey during November and as of today three LNG vessels on its way to Turkey. India LNG imports stands at 13.31 Million Tons from April to November 2017, with November import number stands at 2.16 million tons with 31 vessels. Chinese LNG import for January – November jumped to 33.57 million tons, with November number at 4.48 million tons. 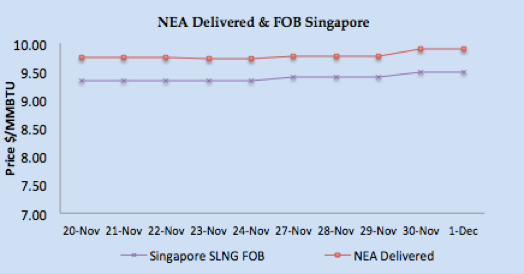 Asian price closures on Friday; SLNG NEA Delivered at $9.89/MMBTU and FOB Singapore at $9.49/MMBTU. Based upon FOB Singapore and Middle East, DES South Asia is calculated around $9.74/MMBTU level. DKI SLNG Index on Friday reported at $9.75/MMBTU. JKM Future curve market remained stable with front month at $9.80/MMBTU along with $9.90/MMBTU & $8.75/MMBTU for February & March 2018 respectively; market is still focus on January deals. China received 16, Japan 29, Taiwan 5 and Korea 13 vessels during the week, depicting regular contract based supply. North West European LNG prices had a bullish run on cold weather with rising coal and crude prices. North West Europe closed at around $7.88/MMBTU, inline with NBP January price. 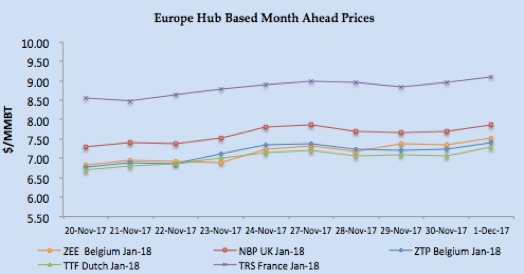 Based upon Iberian Peninsula gas hub price, PEG Nord and TRS along with Asian prices, South Western Europe prices are estimated in the range of $9.00/MMBTU. 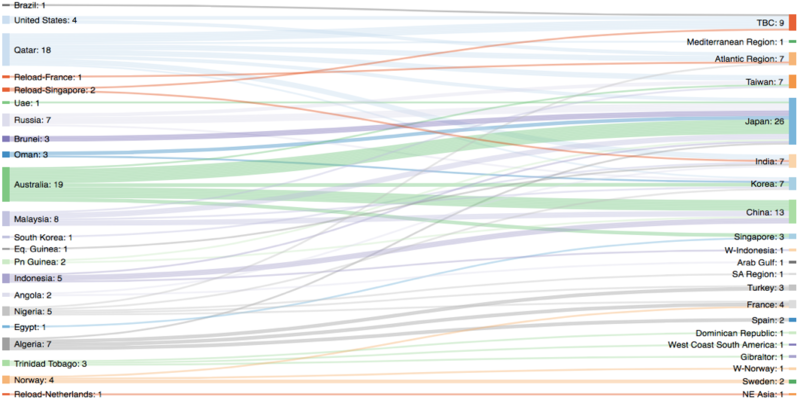 Portugal, Italy, UK, Belgium, Spain and France received total of 11 cargoes, six cargoes for Spain, one each by rest. 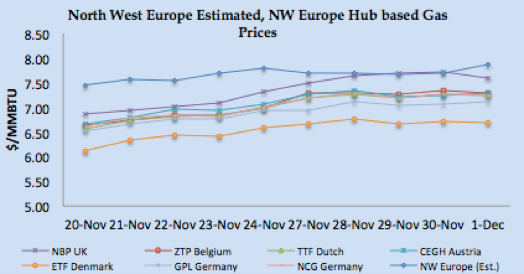 Arbitrage window still open for cargoes from NW Europe to Asia, as netback price is estimated to be around $8.10 whereas NW Europe price for this week comes around $7.90/MMBTU, whereas for SW Europe the window is closed now. US Gulf Coast producer price on FOB basis for January delivery for Asian destination comes around $8.39/MMBTU level, for European destinations the netback comes around $7.33/MMBTU level. 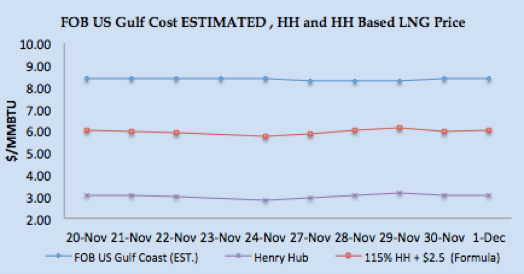 US Henry Hub based price is coming around $6.02/MMBTU for US based liquefaction companies, which translate into $2.37/MMBTU for Asian destination & $1.31/MMBTU for European destination. 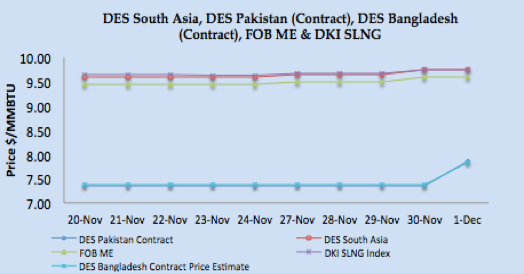 Bullish Brent price impact on formula bas contractual prices estimated to be around $0.50/MMBTU for Pakistan and Bangladesh contracts. Current NEA price of $9.88/MMBTU level is estimated to be 16.85% of Brent 3-0-1 basis. Crude oil price is expected to remain stable, with OPEC cut in place, the market will now see US oil rigs and production number to assess the efficacy of this production cut. US and European gas prices are now in bullish run on weather along with Spanish demand, Gas inventory is high however LNG inventory in UK is around 63%and still there is no cargo arriving at English terminals, impact on LNG prices is bullish. LNG prices stand at a volatile point with fundamentals pressing for northward price movement, we believe price will start climbing up specially on weather parameters from both Europe and North East Asian demand centers. 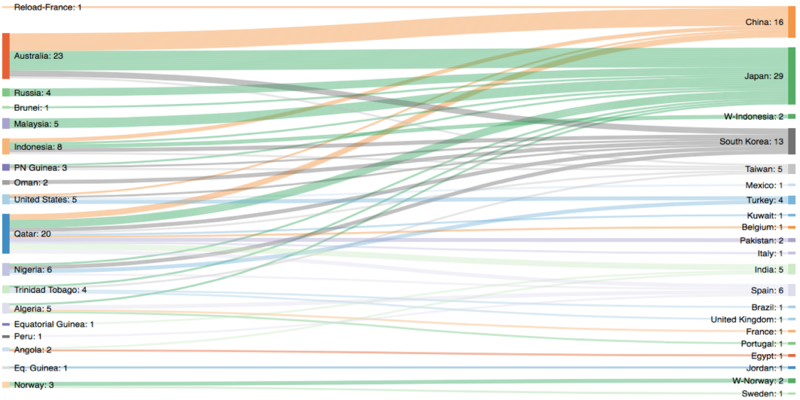 99 vessels carrying 6.60 million tons (317.11.62 BCF) loaded during the week. 95 vessels carrying 6.16 million tons (296.23 BCF) discharged at various demand centres during same time period. Previous Previous post: The Pakistan middle class estimation challenge.